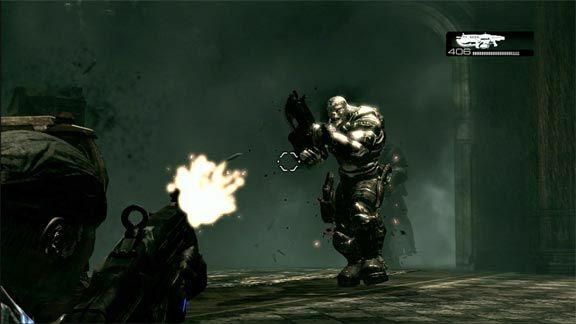 Gears of War review Game Over Online - http://www.game-over.com Halo did it for the Xbox, Grand Theft Auto for the PlayStation 2. Zelda could very well do it for the Wii, Resistance: Fall of Man for the PlayStation 3. I'm of course talking about system sellers, games so good consumers will buy a new console just to play them. 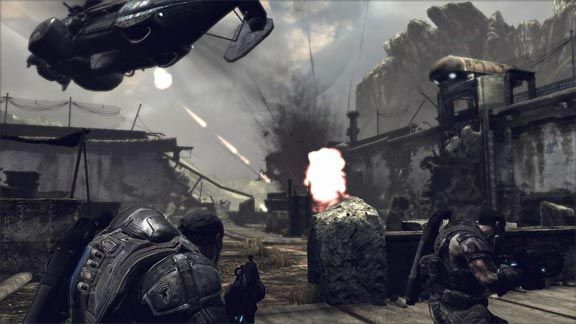 Epic Games' Gears of War has been hyped as just that for the Xbox 360. Now that Emergence Day has arrived and the wait is finally over, is Gears of War the killer app Xbox 360 gamers have been waiting for? Hells yeah! 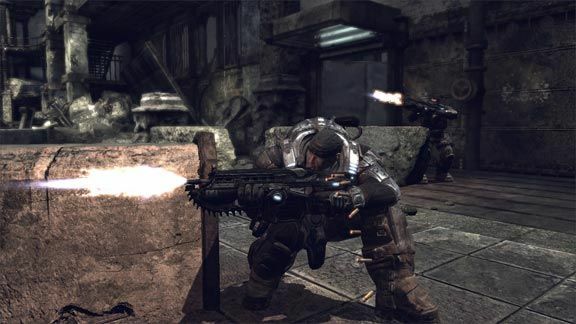 The story in Gears of War is interesting in a sci-fi kind of way, but also full of holes, in a sci-fi kind of way. Fourteen years have passed since Emergence Day, when mankind was invaded by a subterranean race of monsters known as the Locust Horde. Rather than let the Horde keep the spoils of their aggression, humans used chemical weapons and orbital particle beams to neutralize them, along with every city and military base they controlled. 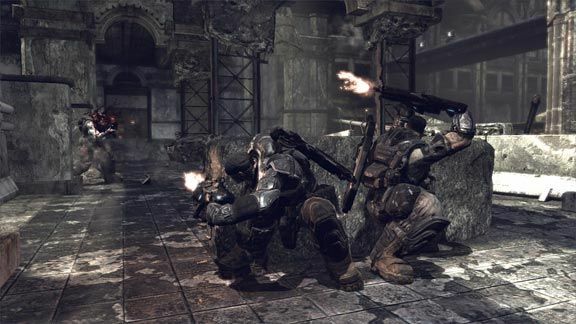 As the game begins, Marcus Fenix is rotting in a prison cell, in the midst of a 40-year sentence, but that all changes when as fate would have it, a soldier named Dominic breaks in and recruits him back into the military. Who are the Locust Horde? What are their motives? Why was Fenix in prison in the first place? These are all valid questions you're likely to pose at one point or another but take it from me, just enjoy the ride. The first thing you're going to notice about Gears of War is how unbelievable the game looks. Using the Unreal Engine 3, Epic Games has created a breathtaking world in ruin. The juxtaposition between the grand architecture and the simmering remains of a time gone by is absolutely amazing. The character models, all brutish in nature, have such detail to them and the animations are incredibly lifelike. All other visual aspects, the weather effects, the lighting effects, the particle effects, the cut-scenes, are all AAA-quality. You will be so captivated by what you're seeing that it may cost you a life or two during the game. The aural experience is just as spectacular. The voice acting is solid throughout, the weapon effects are outstanding and the soundtrack, in a word, epic. It feels like you're in a movie, the production values are that good. Hands-down, Gears of War is the best looking and sounding game on the Xbox 360. So let's talk gameplay. 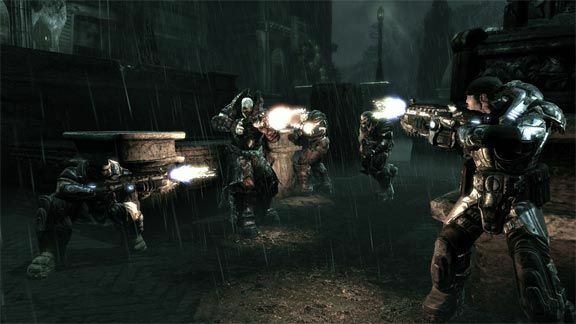 Gears of War is a third-person shooter that stresses the use of cover. If you run-and-gun in this game, you will die, especially on the higher difficulty levels. The controls for the game are surprisingly simple to manage. The A button is the go-to button. Press this near any object, wall or otherwise, and Marcus will get into cover. You can jump over low cover by pressing the A button while in cover. You can also use the A button to swat turn from your current cover to a nearby cover point. You'll also use the A button to perform an evasive roll as well as the Roadie Run. The Roadin Run is a crouched sprint that makes it difficult for enemies to target you. The only problem with the A button being used for so many actions is that you might wind up taking cover behind an object when you meant to evade, or jump over an low cover object when you meant to take cover behind it. Still, it's better than having to manage a whole set of buttons for each action. When you're in cover, you have a couple of options. You can blind fire a suppressive round by pressing the right trigger or you can aim before you shoot, by pressing the left trigger and using the right analog stick to move the crosshairs around. The same goes when you're not in cover, the left trigger will help you aim. The choice of weaponry is your standard shooter fare: pistol, assault rifle, shotgun, sniper rifle and grenades. The assault rifle is unique in that it also has a chainsaw bayonet attached that can be activated in close proximity to an enemy. There's also the Hammer of Dawn, an Imulsion-energized satellite particle-beam weapon that you'll use to take out some of the Locust Horde's larger creatures. It only works outdoors during the day, but it's a great weapon to have when the time is right. 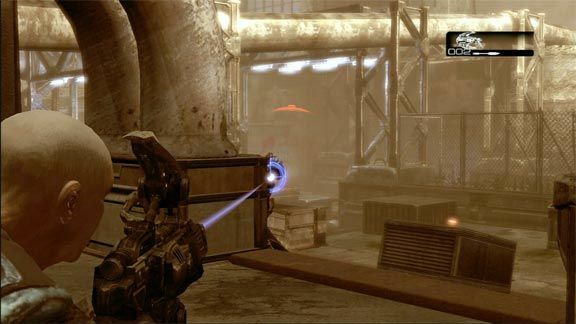 There's also a unique method to reloading in the game, one that can either result in an active reload, allowing you to fire a second clip almost immediately, but also one that can cause your gun to jam and take a long time to reload. 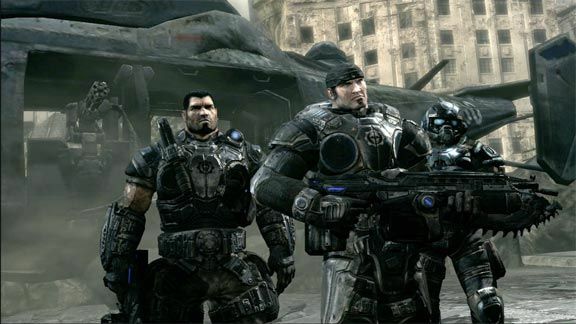 Gears of War is very much a squad-based game. Dominic will almost always be with you, along with Baird and Cole. The friendly AI is actually pretty intelligent, taking cover and advancing at appropriate times. There are some instances, usually when they're scripted to run to a certain spot, that they'll walk right past a grub without killing it, or you'll run past them with a grub chasing you, and they won't kill it. It can lead to a few frustrating moments but all-in-all, the friendly AI is competent enough. The enemy AI is downright nasty. Even more so than your teammates, enemy soldiers will use cover to their advantage, advance when they have the numbers, flank when they have you pinned down, and throw grenades when you're in a strong defensive position. I was very impressed with how the enemy reacted in various situations, it makes the game that much more challenging and rewarding. You might be thinking Gears of War sounds like a one-trick pony with the cover system and you wouldn't be wrong. It is a one-trick pony, but it performs that one trick with such polish and precision that it never gets old. The game throws so many different scenarios at you, so many events, that you'll never have the same firefight twice. There are so many memorable moments in the game; your first encounter with a wretch, your first encounter with a berzerker, a brilliant level at night where you have to stay in the light, a brief level with a vehicle, the list goes on and on. Even the boss battles are different than most games, relying more on puzzle solving and using the environment to your advantage than simply outshooting the monster. All of this adds up to one of the more well-rounded shooters in recent memory. 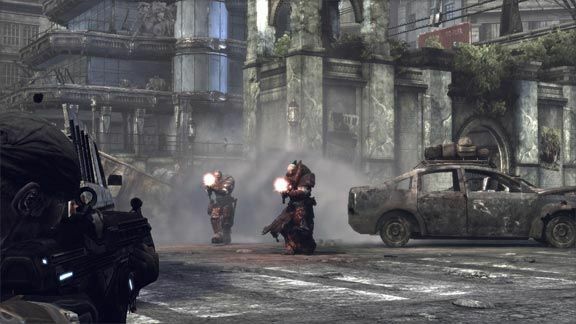 The crowning jewel of Gears of War is multiplayer, which offers up both cooperative and competitive modes. You and a friend can run through the entire singleplayer campaign cooperatively, either in split screen or via Xbox Live. If you're playing a solo campaign and you get stuck, you can invite a friend to jump in online, have them help you make it through that tough spot, and then you can continue back on your own without any help. The competitive mode is limited to 8 players and features 3 game types; Warzone, which is essentially Team Deathmatch, Assassination, and Execution, which is similar to Warzone except you must deliver a close-range special kill to finish off an opponent. Epic Games has also promised more multiplayer content in the future. Halo did it for the Xbox, Grand Theft Auto for the PlayStation 2. Zelda could very well do it for the Wii, Resistance: Fall of Man for the PlayStation 3. I'm of course talking about system sellers, games so good consumers will buy a new console just to play them. 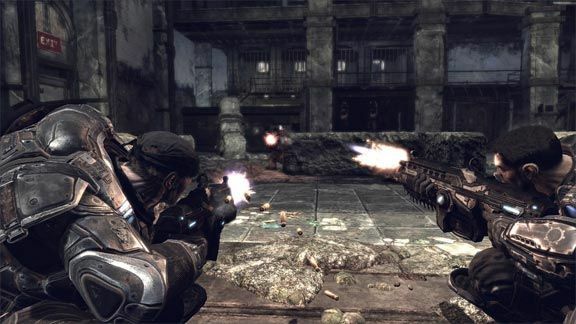 Epic Games' Gears of War has been hyped as just that for the Xbox 360. Now that Emergence Day has arrived and the wait is finally over, is Gears of War the killer app Xbox 360 gamers have been waiting for? Hells yeah! A franchise is born. Is Gears of War a perfect game? No. It's short, at about 8 hours in length, and the last level and a half seems abrupt. I still feel like there's a rail sequence missing when the squad tears away from the mansion in the APC (you'll know what I mean when you play the game). It also doesn't necessarily take the third-person shooter to new heights. What it does, however, is present one of the best looking and sounding games whose gameplay is as polished as it gets, with intense shootouts, exciting boss battles, and sleep-depriving online play. 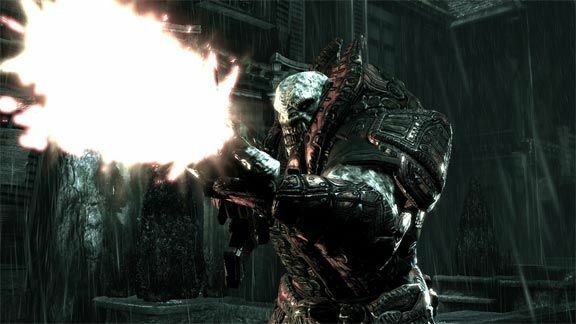 If you don't own an Xbox 360 yet, Gears of War is reason enough to buy one. It is quite simply one of the best games of the year.